Laumeier offers one-week themed Summer Art Camps in half-day morning sessions for ages 4 to 6 and full-day sessions for ages 6 to 12. 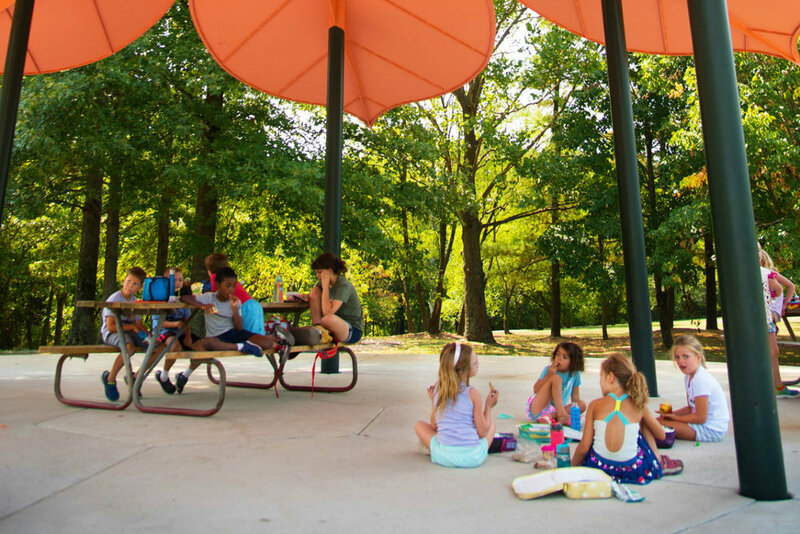 Participants learn about art in a camp setting with field day activities; weekly pool visits; gallery exhibition excursions; and treks through the Park and woodland trails. Campers (divided into groups by age) develop their artistic abilities using a variety of art media and processes including drawing, painting, sculpting and more, while learning about art conservation and history inspiring new ideas to create their very own masterpiece. 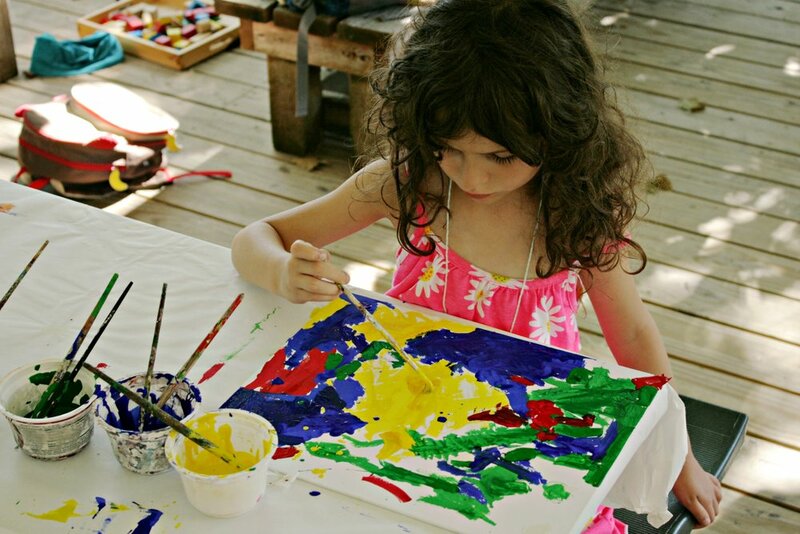 Help your child find their inner artist through a week immersed in art and nature! Summer Art Camps are taught by experienced Artist-Instructors and are structured to encourage artistic development and self-expression through social interaction and individual skill-building experiences. All materials are provided, and each camper receives an exclusive Art Camp t-shirt. Each week features a different theme, so register for more than one session for unique and engaging experiences all summer long! Extended Day is available Monday–Friday for Full-Day Art Camp and Teen Art Program sessions (ages 6–17) only. Already registered for Art Camp or Teen Program? Click “Manage My Account” to view or make changes to your registration. Let worlds of color collide through paint, sculpture and mixed media. Embrace every hue of the rainbow to explode ideas onto your palette! Train your dragon AND your inner artist! Storm the castle for a duel using multimedia tools during this week of epic adventure. You are about to enter another dimension, a world not only of light and sound but of 2- and 3-dimensional art. A journey into a wondrous space where the only boundaries are that of the imagination. Construct and transform the world with things that bubble, stretch and grow! Campers become mad scientists as they explore art in a new way. Create art with hidden meanings and secret surprises. Make your own puzzles and explore optical illusions and magical macro-micro art where there is more than meets the eye. Blast off with Buzz the astronaut and his friends on a creative adventure. Learn about upcycled art and create projects using toys and found materials for a week filled with fun and lessons in sustainability. Explore the world of innovation! Create art that moves your creativity and builds connections between science, technology, engineering and art. Laumeier’s one-week, half-day Art Camps are geared toward creative, energetic youngsters ages 4 to 6. 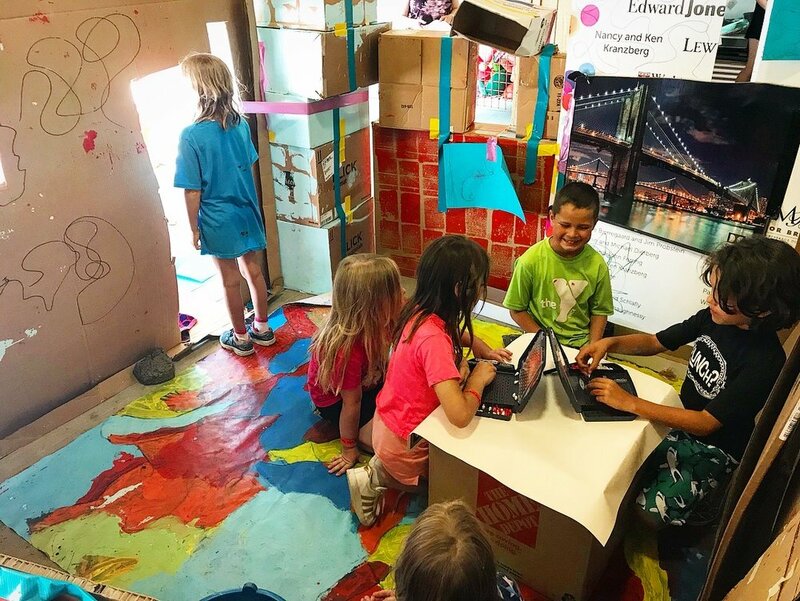 Campers create age-appropriate, themed art projects; explore Laumeier’s trails and sculptures; and enjoy snack time, games, storytelling and more! The average staff-to-camper ratio is 1:5. Half-day Art Camps are held outdoors on the Siteman Carriage House Deck in Laumeier’s Museum Circle near the Park’s Main (Front) Entrance. $120 per session. No camp the week of July 1. Full-Day Art Camps / Ages 6 to 12 / 9 a.m.–3 p.m.
Laumeier’s one-week, full-day Art Camps are designed for creative, active kids ages 6 to 12. Campers (divided into groups by age) learn about artists and art history through hands-on activities; practice using a variety of contemporary art media and processes; explore Laumeier’s outdoor galleries; and enjoy lunch at a different sculpture site each day. Full-day Art Camps spend one afternoon each week at the Sunset Hills Swimming Pool (weather permitting). The average staff-to-camper ratio is 1:7. Camps are held outdoors at the Education Shelters in the Emerson Children’s Sculpture Garden near the Park’s West (Back) Entrance. $210 per session. No camp the week of July 1. LAUMEIER TEEN ART PROGRAM / Ages 13 to 17 / 9 a.m.–3 p.m.
New this year, Laumeier offers three two-week sessions for teens interested in further developing their artistic skills and knowledge through hands-on application and mentorship. The program is designed to stimulate creative expression in an informative, fun and nature-centered atmosphere. 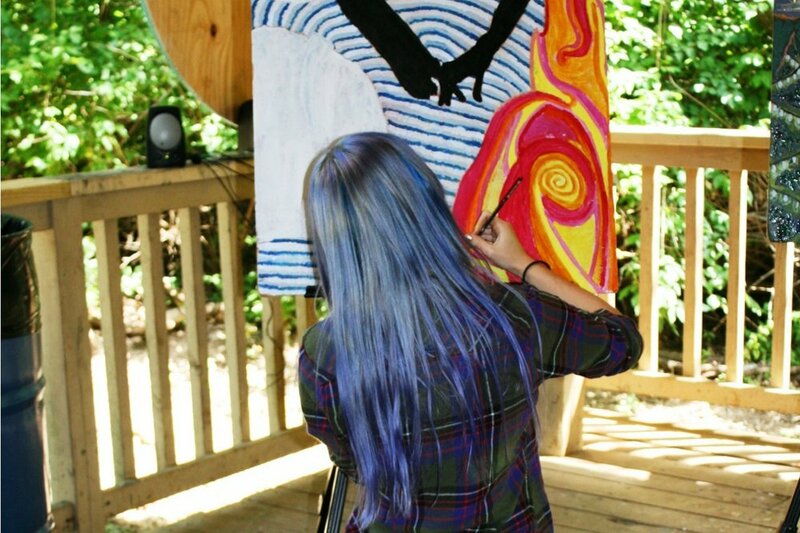 Through guidance from expert art instructors and guest artists, campers are presented a concept in which they are encouraged to self-navigate using the artistic process to develop an idea and see it come to fruition. Campers use multimedia materials and techniques to build a portfolio which they will present to peers in a critique-like format similar to college-level courses. The program is open to all levels of interest, ability and experience. Participants complete the session equipped with the practical skills needed to prepare a college-ready portfolio; exhibit work in a gallery setting; and consider pursuit of a professional career in the arts. Please note: While all three sessions equally encompass the curriculum listed above, each session is led by a different instructor with a distinctive plan of focus for the course, rendering each session unique from the other. Participants enrolling in multiple sessions may choose to work with instructors across sessions on one project or several. Collaborate as a team to produce large-scale pieces. Learn how the science-based discipline of conservation is applied in the field of art. Apply gallery exhibit practices to display your finished project at the end of each session. Gain college-prep experience preparing a professional portfolio. Meet teens who share the same interest. Monday–Friday, 9 a.m–3 p.m. Sessions are held in the camp shelter, Park grounds, Aronson Fine Arts Center and Estate House art studio.